For the very first time, the Bureau of Engraving and Printing (BEP) is selling uncut currency sheets of newly designed $100 notes. 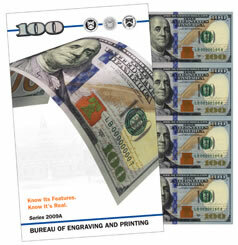 Series 2009A $100 uncut currency sheets launch at 8:00 a.m. EST on Thursday, Feb. 27, 2014. Product options include sheets in sizes of four $100s, eight $100s and sixteen $100s. Coin News Update: The price of the four-subject sheet is $480, the eight-subject sheet is $920 and the sixteen-subject sheet it $1,776. The newly designed $100s entered circulation on Oct. 8, 2013 and feature several added security measures. Among those are two advanced elements for counterfeit protection — a blue 3D Security Ribbon and a Bell in the InkWell. The front of the new $100 bill shows some of its security features under a back light. Micro-images of bells and 100s seem to switch back and forth on the 3D ribbon as the note is shifted. This ribbon is not printed on the paper, but instead is woven into it. The color-shifting bell changes from copper to green when tilted, causing the bell to "disappear" from view. All of the $100 notes from the uncut currency sheets have the designation of the Federal Reserve Bank of Atlanta. Each bears the signatures of Treasurer of the United States Rosie Rios and former U.S. Department of the Treasury Secretary Timothy Geithner. On release day, sheets may be ordered from the BEP’s website at http://www.moneyfactorystore.gov/uncutcurrency.aspx. The Bureau of Engraving and Printing is the nation’s producer of security documents. Among those are Federal Reserve Notes which the BEP prints for delivery to the Federal Reserve System.